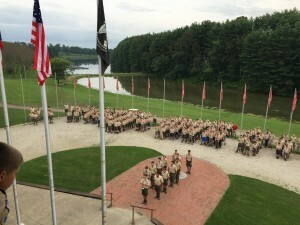 Troop 192 of Central College Presbyterian Church is one of the oldest continually chartered troops in central Ohio with over 75 years of activity. We have a rich heritage of service to Scouting, the community, and to our families. Our Scouts, and especially our Eagle Scouts, represent the best of Ohio and the future of America. We are part of the Simon Kenton Council of the Boy Scouts of America (BSA) that includes 24 counties in Ohio and Kentucky. Our troop strongly supports the boy-led model of leadership. Every activity, meeting, campout and service project involves our scouts making decisions to further our troop goals and the principles of Scouting. The adults in the troop provide guidance and counseling to the boy leaders. Troop 192 is for boys with different interests and skills. We pride ourselves in helping each boy toward his personal goals in Scouting, with the Eagle rank always in sight. Our calendar of activities is geared toward moderate adventure and moderate cost, to enable as many Scouts as possible to attain the rewards of Scouting. Our sponsoring organization, Central College Presbyterian Church, plays an important role in the life of our troop. Reverend Davis and the church staff are enthusiastic supports of Troop 192. Also look us up on Facebook as Boy Scout Troop 192-Westerville Ohio.